Fast food employee strikes: McDonald’s, Wendy’s, and other companies should double their wages. Fast food workers are striking for better pay. Will the industry start listening? 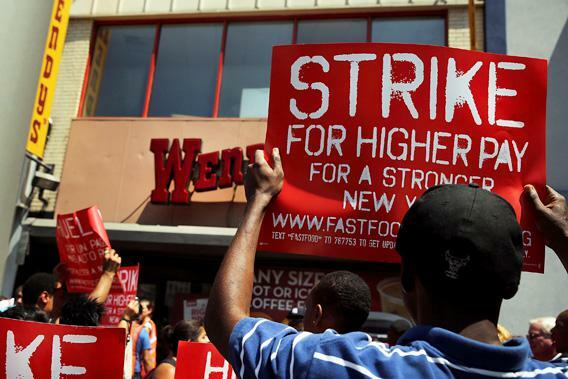 Employees demonstrate for higher pay outside of a New York City Wendy’s. With thousands of fast food employees taking part in strikes in seven major cities across the nation this week over low wages and the right to unionize, the restaurant lobby has issued a forceful response. As hundreds of fast food workers picketed the Union Square Wendy’s in New York City, the industry attacked demands for higher wages as an impossible request that would force companies to lay off workers. The Employment Policies Institute, a group considered by the Citizens for Responsibility and Ethics in Washington to be a restaurant-industry lobbying front, was far more blunt. In a full-page ad in USA Today, the group depicted a plaque celebrating an iPad-faced worker in a fast food uniform as the country’s new model for the “Employee of the Month.” The crudely drawn ad states that if forced to meet the strikers’ requests of a $15 hourly wage—an increase of more than double from the current $7.25 federal minimum wage—fast food restaurants would have to replace these employees with automated alternatives in order to survive. Though unsubtle, the iServer got the point across: Force us to raise wages, and you’ll force yourself out of a job. This is a familiar line of attack for the Employment Policies Institute and similar lobbying organizations. Run by the infamous corporate public-relations advocate Richard Berman, the group has been using self-funded (read: industry-funded) studies in a similar ad campaign against November’s minimum-wage constitutional referendum in New Jersey. So, as recently as six years ago, cutting jobs likely wasn’t necessary to meet pay increases in the restaurant industry. But now that technology has improved and brought iServers with it, would pay increases put jobs at risk anyway? It’s difficult to predict what the effect would be on the U.S., but this sort of employee automation has already happened overseas. In Europe, McDonald’s has installed thousands of touch-screen ordering systems to replace human workers. If such a regime were implemented in the U.S., it could mean 14,000 fewer jobs at McDonald’s restaurants alone. Fast-food-employee activists say that even suggesting that such touch screens could handle the responsibilities of human employees—cleaning tables, mopping floors, cooking burgers—is both insulting and incorrect. Jonathan Westin, director of the Fast Food Forward group that was integral in organizing this week’s strikes and kicking off the fast food wage increase campaign with previous strikes last November, says that if fast food companies could have replaced employees with iServers without sacrificing customer satisfaction, they would have already done so. “It’s a continuation of the fast food industry and the restaurant association’s thinking around how employees are—they’re replaceable property,” Westin said. That more equitable distribution of revenues could be the catch, though. McDonald’s reported $1.4 billion in profits last quarter. That sounds good, but it was actually below expectations, and the company’s stock price growth has lagged behind competitors for most of the year. Industry representatives describe fast food profit margins as pennies on the dollar, but McDonald’s net profit margin consistently hovers around 20 percent and profit margins for its biggest competitors are around 10 percent. The idea that a five-cent increase in the Big Mac price would cover half of the company’s wage increases makes such a plan sound not so burdensome. Without any such pay increase, the benefits of working minimum wage fast food jobs seem to barely outweigh the downsides. Though industry reps often argue that low-paying fast food jobs provide a good entry to the middle class, this is largely a myth, according to a research out this month by the National Employment Law Project. The study found that only 2.2 percent of the jobs in the fast food industry are managerial, professional, or technical, compared to 31.1 percent of jobs throughout the U.S. economy. Front-line employees make up 89.1 percent of fast food industry jobs and make an average of $8.94 per hour, while supervisors make up 8.7 percent of jobs and make $13.06 per hour on average. Wage stagnation can force even long-term employees on to food stamps. On top of that, job conditions can also be atrocious. Earlier this summer, New York City McDonald’s workers were forced to work in record heat without air conditioning. Worse still, minimum wage employees are often not even paid the minimum wage. “The industry has a system-wide practice of not only paying workers the most minimum wage you could possibly pay, but also bilking as much as they can in terms of stealing wages,” said Westin. A survey by Fast Food Forward found that 84 percent of fast food employees had reported some kind of “wage theft” in the previous month, be it in the form of bounced checks, hours worked off the clock, or having to pay for your own gas or uniform. The New York attorney general is investigating the charges. The point is that once you get past the question of threats to existing or future jobs, the question of basic fairness seems like a no-brainer. If you’re buying a Big Mac, you can probably afford to pay five cents more to ensure the person serving it can afford to pay her rent. And if you’re employing that person, the hit to your bottom line probably won’t be so bad that you have to replace her with this guy.